Matthew Montgomery Barkley (born September 8, 1990) is an American football quarterback for the Chicago Bears of the National Football League (NFL). He was drafted by the Philadelphia Eagles in the fourth round of the 2013 NFL Draft. He played college football at USC. Barkley was born in Newport Beach, California. He attended Mater Dei High School of Santa Ana, California. In 2005, he became the first freshman quarterback to start at Mater Dei High School since Todd Marinovich. As a freshman he passed for 1,685 yards and 10 touchdowns, but suffered a season-ending injury (broken collarbone) during the playoffs in a quarter-final win over Colton High School. The injury was caused by future USC teammate, running back Allen Bradford, who played linebacker in high school. Barkley was named 2007 football Gatorade National Player of the Year, and then the 2007 Gatorade national male athlete of the year, becoming the first non-senior to win both awards. Barkley also won the 2007 Glenn Davis Award, given to best high school football player in Southern California, as well as the inaugural Joe Montana Award as the nation's top high school quarterback. Barkley was rated as the first overall prospect in the nation for the Class of 2009 by ESPN. He was rated the first overall prospect by Rivals.com. Quarterback coach Steve Clarkson described Barkley as a cross between Joe Montana and Tom Brady. Barkley in 2008 visiting a USC practice before his senior season after he verbally committed to Trojans. His 2008 senior season started slow, with Barkley throwing nearly as many interceptions as touchdown passes and the Monarchs barely keeping above .500; however his performance turned around and Mater Dei rallied to 7–3 and entered the playoffs. The Monarchs made it to the quarterfinal, falling to Tesoro High School and ending the season 8–4. Barkley finished his Mater Dei career as the all-time passing yardage leader in Orange County, surpassing the record set by Todd Marinovich in 1987. He graduated from high school on December 18, 2008. On January 4, 2009, Barkley participated in the 2009 Under Armour All-America Game at the Florida Citrus Bowl. After a strong performance, where he completed 11-of-22 passes for 237 yards and two touchdowns and led the White team to a 27–16 victory over the Black team, he was named the game's co-MVP. Soon afterward, he was moved back to the number one high school prospect in America by ESPN, having dropped to tenth during his senior season. "2009 USC Football Recruiting Commits". Scout.com. Retrieved February 2, 2013. "Scout.com Team Recruiting Rankings". Scout.com. Retrieved February 2, 2013. Barkley during a post-game interview with ESPN College GameDay's Chris Fowler (left) and Kirk Herbstreit (center) in Ohio Stadium. He adapted to the Trojans offense and gave strong performances during spring practices: trying for and making big plays but also throwing several key interceptions. Impressing his coaches, Barkley climbed to the number two spot at the end of Spring behind Corp. Afterward, ESPN NFL Draft analyst Mel Kiper stated he believed that in "three years Matt Barkley—who will be a true freshman this year—will be the No. 1 pick in the draft." 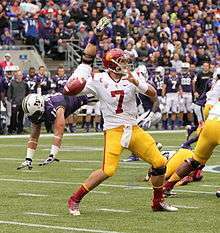 On August 27, during fall practices, Carroll named Barkley the starter for the 2009 season opener against San Jose State. He is the first true freshman quarterback to ever start an opener for the Trojans, and also the first true freshman to start the opener for a preseason top-five team since Rick Leach did it for No. 3 Michigan in 1975. After a slow first quarter, Barkley finished his college debut 233 yards, throwing 15-for-19 with one touchdown in a 56–3 victory. Barkley suffered a shoulder bruise in the Ohio State game, and had to sit out the following week's game at Washington. With Aaron Corp at the helm, the Trojans struggled in a major upset loss, falling to the unranked Huskies 16–13 while putting up the lowest number of passing yards for a USC team since Carroll took over the program in 2001. Carroll had Barkley, who was not fully recovered from his injury, start the next game against Washington State. Barkley contributed to a 27–6 victory, passing for 247 yards and two touchdowns. He followed this up with 282 passing yards in a 30–3 win over California on October 3. The next week against Notre Dame, he was 19 for 29 with 2 TD's. He followed that up with a 15–25 two touchdown game against Oregon State. Against Stanford he threw 3 interceptions and only 1 touchdown. Two weeks later he went 1 touchdown and 1 interception in a 28–7 victory over UCLA. The following week he also, went 1–1 in a 21–17 loss to Arizona. He closed his freshman season by throwing for 350 yards and 2 touchdowns against Boston College in the 2009 Emerald Bowl. Barkley began 2011 by setting the USC single game record for completions with 34 against Minnesota. On October 1, he passed for a USC single game record for 468 yards. On November 4, he passed for a USC single game record for touchdowns in a game with 6, against the Colorado Buffaloes, one of the two additions to the Pac-12 in its inaugural season; the game was the first against Colorado since 2002. He had previously tied the single game touchdown record three times, sharing it with Rodney Peete, Carson Palmer, Matt Leinart and Mark Sanchez. On November 26, against the UCLA Bruins, he tied the single game touchdown record again in a 50–0 shutout of the Bruins. On national television Barkley stated that the best moment of the UCLA game was his pass to his cousin Robbie Boyer. Over the 2011 season, Barkley accumulated 39 touchdowns, an all-time Pac-12 record, and helped end the season with a 10–2 record. Barkley had the 6th most votes for the Heisman Trophy. He finished with a 39–7 touchdown-to-interception ratio while completing 69.1% of his passes. He won the 2011 CFPA National Performer of the Year Trophy with his record breaking season. Going into his senior season, Barkley was widely considered a favorite to win the Heisman Trophy. At the beginning of the season, USC was ranked #1 in the preseason poll, but a 21–14 loss to then-#21 Stanford ended USC's potential BCS national championship run. USC then went on to lose 5 games that year, as well as losing to rival UCLA for the first time in six years. Matt Barkley was knocked out of that game by UCLA's Anthony Barr with a shoulder separating hit, thus ending his regular season abruptly. On December 27, 2012 head coach Lane Kiffin announced that Barkley would not play in the Sun Bowl because of a shoulder injury, effectively ending his college football career. Barkley was selected by the Philadelphia Eagles in the 4th round as the 98th overall pick. Going into training camp, it was announced that Barkley would be given a chance to compete for the starting quarterback job, facing off against the two starting quarterbacks from the previous season, Nick Foles and Michael Vick. On October 20, 2013, he saw his first NFL action against the Dallas Cowboys as he came into relief for Nick Foles, who left early in the fourth quarter due to a head injury. In that game, Barkley completed 11 of his 20 pass attempts for 129 yards, and threw 3 interceptions. Barkley's second game came the following week in relief of Foles (concussion) and Vick (quadriceps) on October 27 versus the New York Giants. Barkley completed 17 of 26 passes for 158 yards, no touchdowns, 1 interception and 1 fumble inside their red zone. The Eagles traded Barkley to the Arizona Cardinals for a conditional seventh round pick in the 2016 NFL Draft on September 4, 2015. The terms said that he needed to be on the roster for 6 games, which were fulfilled on October 17, 2015. On September 3, 2016, Barkley was released by the Cardinals. Barkley was signed to the Chicago Bears' practice squad on September 4, 2016. He was elevated to the active roster on September 22, 2016. Following an injury to the Bears' backup quarterback Brian Hoyer against the Green Bay Packers on October 20, Barkley made his first NFL appearance as a Chicago Bear, going 6/15 for 81 yards; he threw for zero touchdowns and two interceptions. After Jay Cutler suffered a shoulder injury against the Giants, Barkley started the following week's game against the Tennessee Titans. Barkley completed 28 of 54 passes for 316 yards with three touchdowns, two interceptions and a 72.8 passer rating, nearly rallying the Bears from a 20-point deficit in the fourth quarter before losing 27–21. Barkley earned his first NFL win the very next week on December 4, 2016 in a 26-6 win over the San Francisco 49ers at Soldier Field. Barkley is a devout Christian and played acoustic guitar with his church youth group. His father Les co-owns an insurance business with his brother in-law. At Mater Dei, Barkley's parents started the Monarchs for Marines (M4M) campaign, whereby hundreds of Mater Dei students, coaches and parents volunteered to landscape and renovate youth areas at nearby Marine Corps Base Camp Pendleton. Barkley had a 3.77 GPA in high school and frequently speaks to young students about the importance of staying on top of school work. He graduated from the University of Southern California in 2013 with a degree in communications and a minor in business. Barkley's cousin, Robbie Boyer, was a walk-on at USC during Barkley's freshman, sophomore, and junior years. Barkley's younger siblings, twins Sam and Lainy, attend USC. During Christmas 2008, Barkley went with a group of friends and family to help run an orphanage in South Africa. For Christmas 2010, he spent his winter break in Nigeria "visiting orphans, widows, villagers and prisoners, doing construction work, distributing supplies and gifts and sharing daily fellowship.". In 2012, Barkley led a group of 16 USC football teammates to Haiti, building houses as well as delivering more than 2,000 pounds of supplies for orphanages and schools. He appears on I Am Second, sharing the story of his Christian faith and personal relationship with Jesus Christ. At the beginning of his USC career, Barkley befriended former USC Olympian, World War II prisoner of war and inspirational speaker, Louis Zamperini. Barkley married his high school sweetheart Brittany Langdon, a year after he graduated USC, in July 2013. In December 2014, she announced via Twitter that she was pregnant. 1 2 Evans, Thayer (2008-02-11). "Coveted Quarterback Looks to Thrive on Next Level". New York Times. Retrieved 2008-02-23. 1 2 3 4 Christopher Lawlor (April 1, 2008). "Grounded in faith, Barkley leads the way for Mater Dei". ESPN.com. Retrieved January 8, 2009. 1 2 3 Jeff Fellenzer, "There is no goal that USC's Matt Barkley won't pursue", Los Angeles Times, October 29, 2009; accessed October 29, 2009. 1 2 Arash Markazi (February 5, 2008). "Fully committed". www.SI.com. Retrieved January 8, 2009. ↑ Maya, Adam (2008-07-16). "Mater Dei's Barkley national athlete of the year". Orange County Register. ↑ "Montana to award Barkley". Daily Pilot. 2007-12-27. Retrieved 2008-02-23. 1 2 Tom Luginbill, Barkley proves he deserves No. 1 spot in ESPNU 150, ESPN.com, January 8, 2009; accessed January 8, 2009. ↑ ESPNU 150, ESPN.com, January 8, 2009, Accessed January 8, 2009. ↑ Rivals100: Class of 2009, SI.com (in conjunction with Rivals.com), February 8, 2008. ↑ "Rivals100: Class of 2009". SI.com. February 8, 2008. 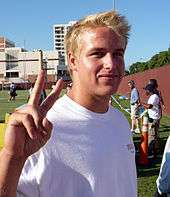 ↑ Scott Schrader, Matt Barkley Commits To USC, WeAreSC.com, January 23, 2008, Accessed January 8, 2009. ↑ Arash Markazi, Fully committed, SI.com, February 5, 2008. 1 2 3 4 5 Ben Bolch (November 21, 2008). "Mater Dei's Matt Barkley silences his critics". Los Angeles Times. Retrieved December 1, 2008. ↑ Greg Biggins, Barkley selling USC to recruits, ESPN.com, August 12, 2008; accessed January 8, 2009. ↑ Ben Bolch, Mater Dei's Matt Barkley silences his critics, Los Angeles Times, November 21, 2008, Accessed January 8, 2009. ↑ Tesoro hangs on to beat Mater Dei, Los Angeles Times, November 29, 2008; accessed January 8, 2009. 1 2 3 Scott Schrader, Barkley enrolling at USC next week, WeAreSC.com, January 6, 2009; accessed January 8, 2009. ↑ Christopher Lawlor, In game loaded with stars, Barkley outshines them all, ESPN.com, January 4, 2009; accessed January 8, 2009. ↑ Andy Staples, Under%20Armour%20All-America%20Game%20notebook:%20Gators%20land%20Harvin%20clone "Under Armour All-America Game notebook: Gators land Harvin clone", SI.com, January 5, 2009; accessed January 8, 2009. ↑ Adam Rose, UCLA vs. USC: Talkin' quarterbacks at a basketball game, LATimes.com, January 12, 2009; accessed January 12, 2009. ↑ Ivan Maisel, Knowledge pushes Corp to top, ESPN.com, April 28, 2009, Accessed June 22, 2009. ↑ Gary Klein, Matt Barkley passes one more test, April 12, 2009, Accessed June 22, 2009. ↑ Pucin, Diane (April 25, 2009). "Mel Kiper says watch out for USC's Barkley". Los Angeles Times. Retrieved April 28, 2009. ↑ Klein, Gary (August 27, 2009). "Matt Barkley named USC's starting quarterback". Los Angeles Times. ↑ "Barkley a first since 1975". ESPN Stats & Information. September 3, 2009. ↑ Bill Plaschke, "Matt Barkley gets the USC party started", Los Angeles Times, September 6, 2009, Accessed September 9, 2009. ↑ Stewart Mandel, New faces emerge to produce familiar results for resilient Trojans, SI.com, September 13, 2009; accessed September 14, 2009. ↑ Bill Plaschke, Matt Barkley gives USC one to grow on, Los Angeles Times, September 13, 2009, Accessed September 14, 2009. ↑ What We Learned: Week 2, ESPN.com, September 13, 2009; accessed September 14, 2009. ↑ Gary Klein and Bill Plaschke, USC's passing game with Aaron Corp can't get going, Los Angeles Times, September 20, 2009, Accessed September 22, 2009. ↑ Gary Klein, "Trojans' Matt Barkley still has pain, but he's not worried", Los Angeles Times, September 30, 2009; accessed September 30, 2009. ↑ Klein, Gary (December 22, 2011). "Matt Barkley will return to USC for senior season". Los Angeles Times. Retrieved 2011-12-22. ↑ Houston, Chris. "2012 Heisman Watch". cbssports.com. Retrieved 12 January 2013. ↑ O'Connor, Kyle. "Matt Barkley Heads List of 2012 Heisman Trophy Contenders". footballnation.com. Retrieved 12 January 2013. ↑ Pedro, Moura. "Career Over for USC's Matt Barkley". espn.go.com. Retrieved 31 December 2012. ↑ Patterson, Chip (December 22, 2011). "Matt Barkley skips NFL Draft, returning to USC". ↑ Brooks, Bucky (April 29, 2012). "2013 NFL Draft: USC's Barkley, Woods among top 30 prospects". NFL News. ↑ Prisco, Pete (April 30, 2012). "Top 32 for 2013: Barkley headlines a class that already looks deep". CBS Sports. ↑ Schrager, Peter (May 1, 2012). "Schrager's 2013 mock draft". Fox Sports. ↑ Gaines, Cork (March 28, 2013). "Matt Barkley May Have Lost More Than $15 Million By Playing His Senior Season". Business Insider. ↑ Farrar, Doug (February 18, 2013). "USC QB Matt Barkley will not throw at the scouting combine". Yahoo! Sports. Retrieved February 18, 2013. ↑ "Matt Barkley". nfldraftscout.com. Retrieved September 3, 2016. ↑ "Eagles take Matt Barkley at No. 98". ESPN. April 27, 2013. ↑ Sheridan, Phil (September 4, 2015). "Eagles deal Matt Barkley to Cards, potentially opening spot for Tim Tebow". ESPN.com. Retrieved September 5, 2015. ↑ Alper, Josh (September 4, 2016). "Matt Barkley to Bears practice squad, Logan Paulsen to active roster". NBCSports.com. Retrieved September 4, 2016. ↑ Bergman, Jeremy (September 22, 2016). "Bears elevate QB Matt Barkley to active roster". nfl.com. Retrieved September 22, 2016. ↑ Emma, Chris (November 27, 2016). "Bears QB Jay Cutler Inactive; Matt Barkley Starts Against The Titans". WBBM-TV. Retrieved November 27, 2016. ↑ Mayer, Larry (November 27, 2016). "Bears' rally falls short in 27-21 loss". Chicago Bears. Retrieved November 28, 2016. ↑ "Matt Barkley". pro-football-reference.com. Sports Reference LLC. Retrieved September 3, 2016. 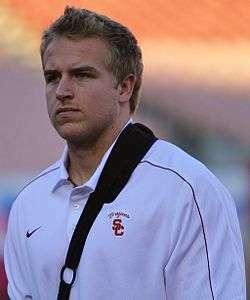 ↑ "Matt Barkley, Mater Dei football, biography". The Orange County Register. 2008-07-24. Retrieved 2008-07-31. 1 2 "Matt Barkley". USC Football Team Roster. Retrieved 2015-02-05. ↑ "Samuel Barkley". USC Football Team Roster. Retrieved 2015-02-05. ↑ "Matt Barkley" (PDF). Matt Barkley Media Biography. Retrieved 2015-02-05. ↑ "Matt Barkley - I Am Second". I Am Second. Retrieved January 9, 2012. ↑ "Catching Up With ... Brittany Langdon Barkley". Seattle Pacific University. 2014-07-11. Retrieved 2015-02-05.